Our mission is to present quality workmanship in a safe, efficient and productive manner. We provide the highest quality Line Marking services delivered in a safe and environmentally friendly manor by utilising premium equipment and materials. 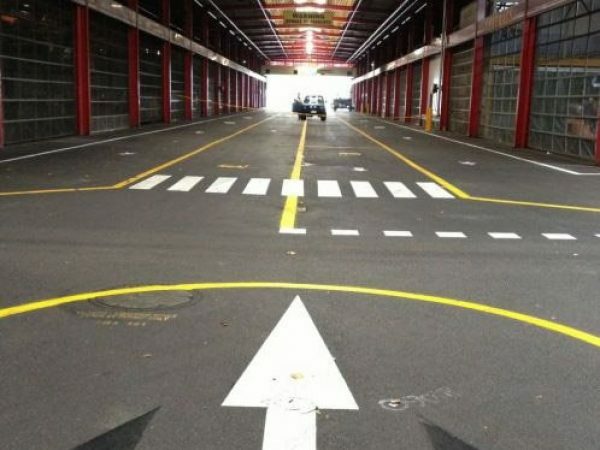 Apex Line Marking also provides the best bollard, wheel stop and speed hump supply/install service anywhere in Sydney. Apex Line Marking - Northern Beaches. Proudly serving Sydney's Northern Beaches since 1994. Whenever you need to get a sports field or even a road marked with a diving or marking lines, you need to hire professionals to do that sort of work. It is trueservices are pretty essential, whenever you are developing or building almost anything. For example, if you are building a commercial shopping center, you would need to hire these kinds of companies to mark the lines of your parking lot, car garage, and even entrances. But if you are not yet convinced that you should hire these companies, here are some benefits that you could gain if you did. These companies can give you the fastest work done when it comes to marking down all of the diving and other kinds of lines that you would need. Normally, this kind of work takes a lot of time, but because these companies are skilled enough and are properly equipped, they can get the work done much faster than you can. If you hire professionals to mark your lines, then they could also provide additional services such as professional floor sealing. This sealant can protect your floor lines. You would not have to worry about the lines getting scuffed every again. You should not leave line marking work to amateurs. If someone, who did it, does not have the proper equipment or experience, then the line will not come out precise or straight. And that is why you have got o hire professional commercial companies to create those line markings. It is the only way to get the benefit of having the most precise lines. With the right kind of people that you hire for line marking work, you should be able to get all of the benefits that were just listed in this article. So if you would want to get all of these advantages of hiring a professional to handle commercial line marking, you should be careful about who you hire. Do not just hire the first line marking company that you come across. There are many line marking Sydney based companies out there, but not all of them are going to deliver the same quality of work. So you should try and do a bit of research on which line is marking crew you should hire in your area or city. "Our mission is to present quality workmanship in a safe, efficient and productive manner." - A message from the CEO.